This year we are going to portray the famed Fighting Floppy 503rd, known as the “li’l brother” unit to the famed 501st Legion of Imperial Stormtroopers. We will march, eat and drink alongside the stormtroopers until we are too tired, too bored or too beaten-up to continue. Odds are on that last choice, so you might want to wear some bubble wrap inside your costume. 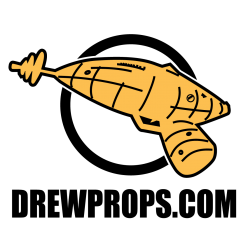 Please note that it is imperative that you bring some sort of cardboard tube with you as it will represent your Imperial Blaster, a weapon famed for its inaccuracy. DAMN ! DAMN ! This is the only day I can’t/won’t be at the Con.!!!!!!!!!!!!!!!!! Why can’t it be Sat?????????????????? Okay, enough people have asked me to change this event to Saturday, September the 2nd that I am acquiescing because I’m not going to do this by myself. I’ve spoken with one of you about the possibility of marching in the parade on Saturday. After thinking about it I think someone should find out if they require you to possess a convention badge to participate in the parade. It would stink if you went to all that effort, walked over to the park and then found out that you wouldn’t be allowed to march. I’ll have a 4-day pass but some of you guys may not. Food for thought. Hey, We saw your cardboard storm trooper squad. For us, it was the highlight of the ‘con. Thanks guys. We laughed so hard it made the 3 hr wait for badges worth it. Maybe we can join ya next year. Looks like a lot of fun. Keep up the good work. Keep up the good work. That line was KILLER yesterday!! I’m so glad that I pre-registered again this year. When we arrived at the mustering point down at Woodruff Park it was a little intimidating to go clunking up toward the 501st because we had no idea how they’d interpret us. Over the course of the day we had a LOT of guys from the 501st come over to us and say how funny they thought we were. There was one convention goer who asked one of our guys if we were disgruntled former members of the 501st, which shows that there’s a conspiracy theorist in every crowd. Between us we probably lost a swimming pool of water, those boxes are hot!! Wonder how they compare to the real armor? 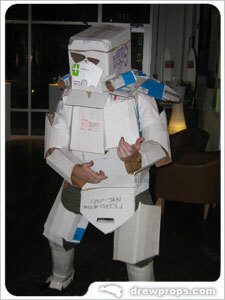 I actually had a real Stormtrooper costume on under the cardboard box one. Yes, it was hot. I would like to take the time to thank my agent, my publicist and my mom for supporting me during the whole 2006 Dragon Con. Thank you to my wife for having the faith in me and knowing I had a Cardboard heart just waiting for an outlet to show itself, for everyone to see and love. My only question is, do I have to put the cardboard box (Stormtrooper) back in a box or is it already a box in itself? Can you add spell check to this Blog?